SEPANG (Sept 15): AirAsia Bhd is short of "eight to nine" aircraft until 2017 as it strives to meet market demand for its services by advancing aircraft deliveries, said the low cost carrier's founder Tan Sri Tony Fernandes. In a reception ceremony for the airline's first Airbus A320neo, the AirAsia Group chief executive officer told the press that the group is likely to advance its aircraft orders to meet these demand. 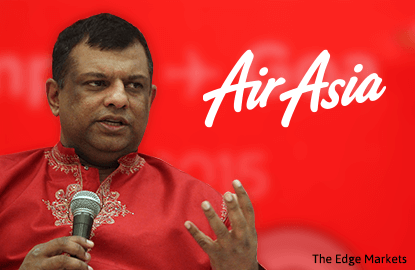 "The demand is very strong, AirAsia is probably having its best growth in a lot of time. All of the countries that we operate in are reporting significant growth. Indonesia is doing fantastically well, having an 83% load factor (for second quarter ended June 30, 2016)," he said. "Malaysia will be having the highest load factor in the third quarter (of 2016), where we are having over 90%, and India and Thailand are also doing very well. So we are actually advancing, to take delivery of these aircraft much quicker than we originally planned," he added. Fernandes also attributed the stronger potential growth in Asean's aviation industry to the implementation of Asean Open Skies agreement. "We will definitely [continue to] fly to more countries in the region to make not only Asean but [also] Asia region a smaller [more connected] place," he said. AirAsia today received its first A320neo aircraft, which comes with a 186-seating configuration and delivers up to 15% fuel savings. This is the first of four scheduled deliveries of Airbus A320neo for AirAsia in 2016. There will be another 14 deliveries in 2017, according to the original schedule back in 2011. AirAsia made the 200 Airbus A320neos order back in 2011. The order is worth US$18.5 billion (about RM76.5 billion) at list prices. In July, the group made another firm order for 100 Airbus A321neo aircraft during the Farnborough Airshow, racking up total order of 575 aircraft from Airbus, being the latter's biggest airline customer for the A320 series. AirAsia is the first airline in Southeast Asia to operate the Airbus A320neo aircraft powered by CFM International LEAP-1A engines. The ceremony was also attended by Transport Minister Datuk Seri Liow Tiong Lai, French Ambassador to Malaysia Christophe Pinot, British High Commissioner to Malaysia Victoria Marguerite Treadell, AirAsia executive chairman and AirAsia X Group CEO Datuk Kamarudin Meranun. Also present were Airbus executive vice president strategy and marketing Kiran Rao and CFM executive vice president Allen Paxson.